Brighton & Hove Albion manager Chris Hughton does not expect to make many signings during the January transfer window. 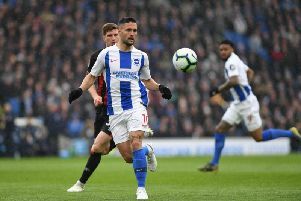 The Seagulls signed Alireza Jahanbakhsh, Yves Bissouma, Florin Andone, Martin Montoya, Bernardo, Leon Balogun, David Button and Jason Steele in the summer and Hughton is not anticipating too many - if any - new arrivials coming in during the next transfer window. Hughton was asked if he is already thinking about January and said: "As regards the processes, as soon as the summer window closes we have a recruitment team and group who are already thinking of January and next season. "What happens is during that season, sometimes circumstances change a little bit. "If I'm looking at our squad at the moment, we've got players that have come in during the summer that haven't played perhaps the part they would have liked. "As regards any work in January, I don't see a lot of work, if any. "But we have to think about potential areas we could strengthen and sometimes a late one comes in that you didn't think was going to. It's on-going." As for players heading out on loan in January, Hughton said: "Not at the moment. You can never know but if you're asking me at this moment, the players we have brought in, all of their efforts are going towards getting into the team as quick as they can, doing the right things and waiting for that opportunity. "There are no signs at this moment that we might lose somebody apart from potential players that haven't had the minutes they would have liked but they wouldn't be players we brought in during the summer."